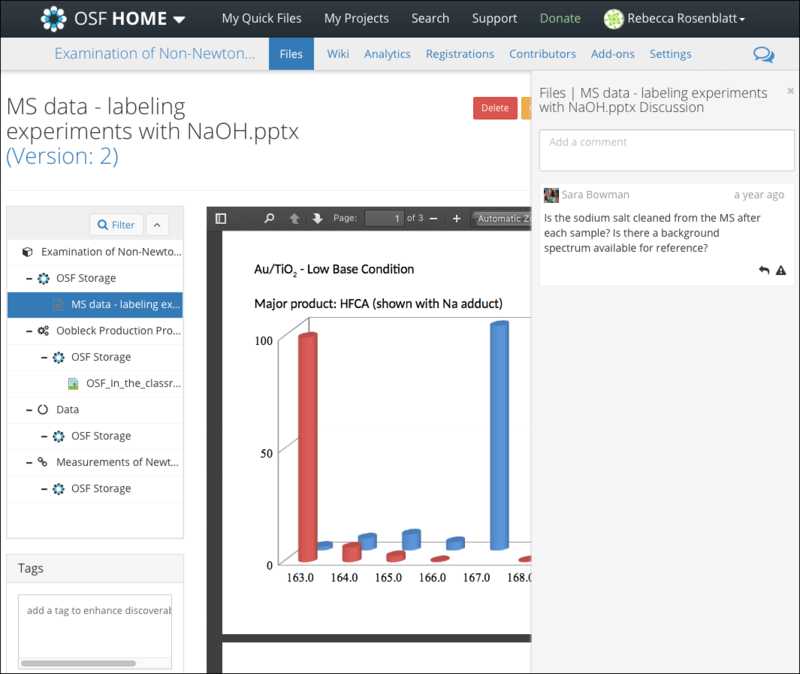 Users can leave comments on OSF projects and files. Commenting can be configured to allow only project contributors to comment or to allow any OSF user to comment. 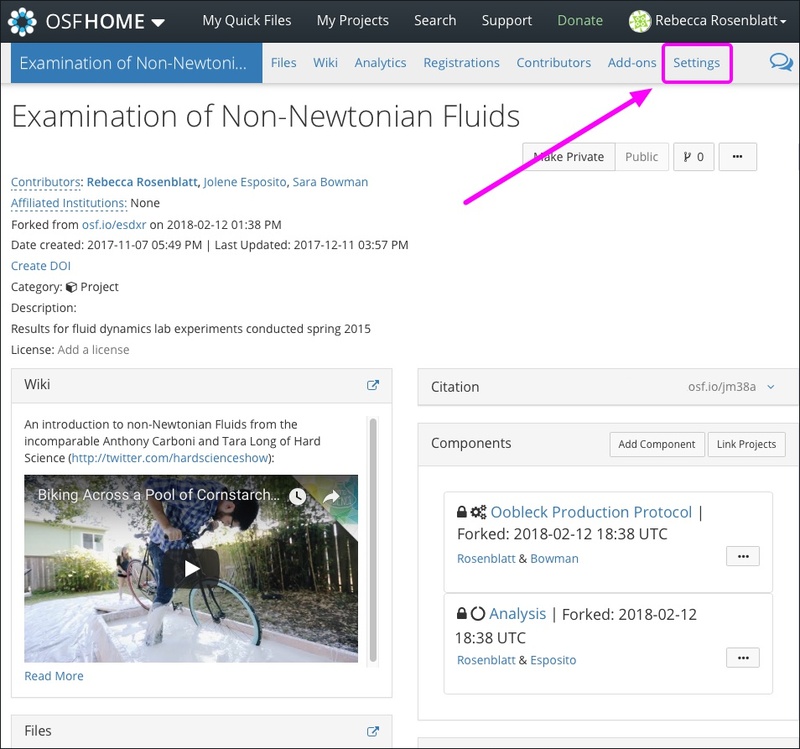 To configure who can leave comments on your project, first go to the project or component, and click the Settings tab in the project's navigation bar. 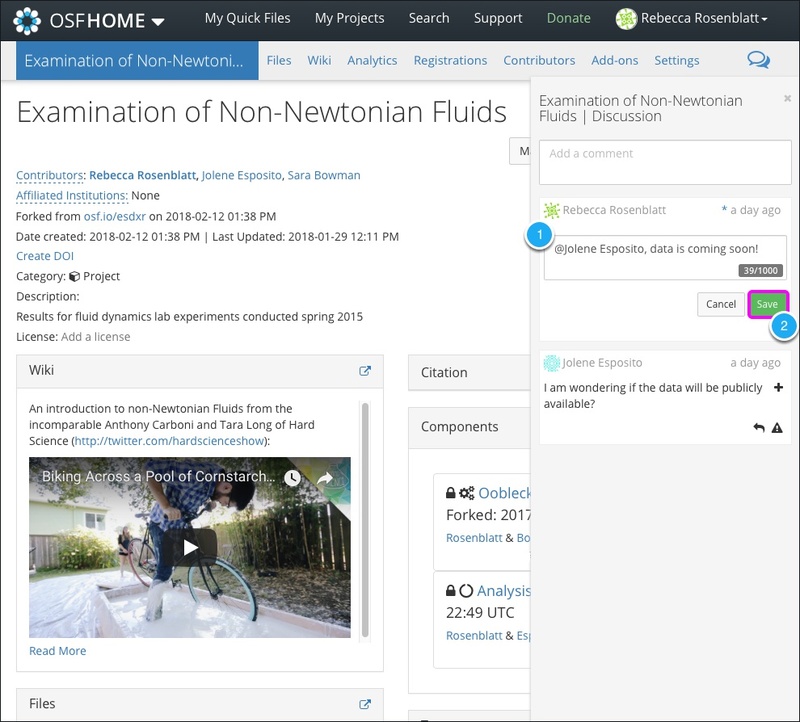 Click Commenting in the left sidebar, then choose who can comment on your project. 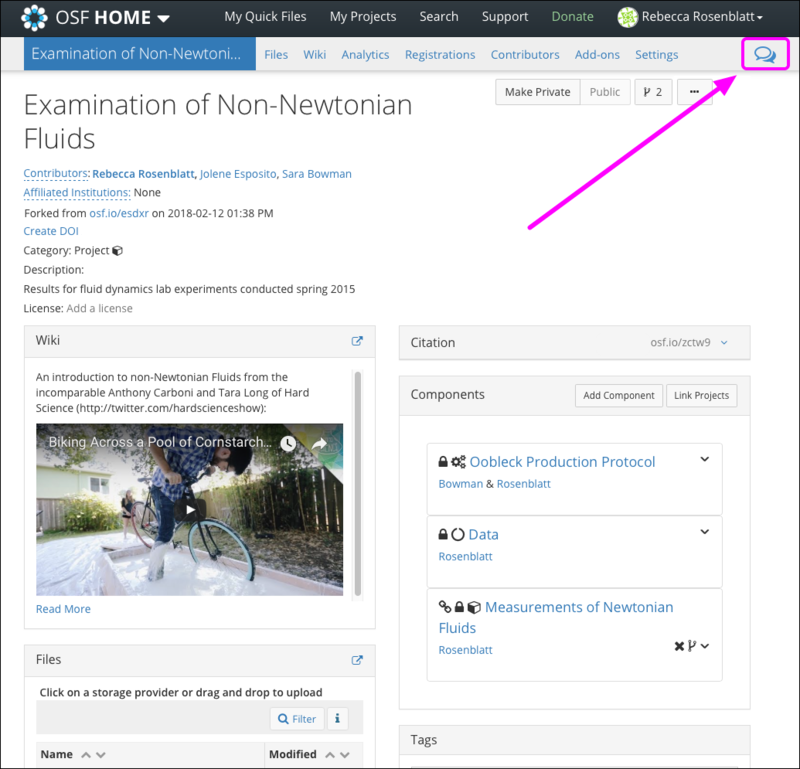 By default, commenting is configured so that any OSF user can post comments on public projects. Click the Save button when you're finished configuring commenting settings. 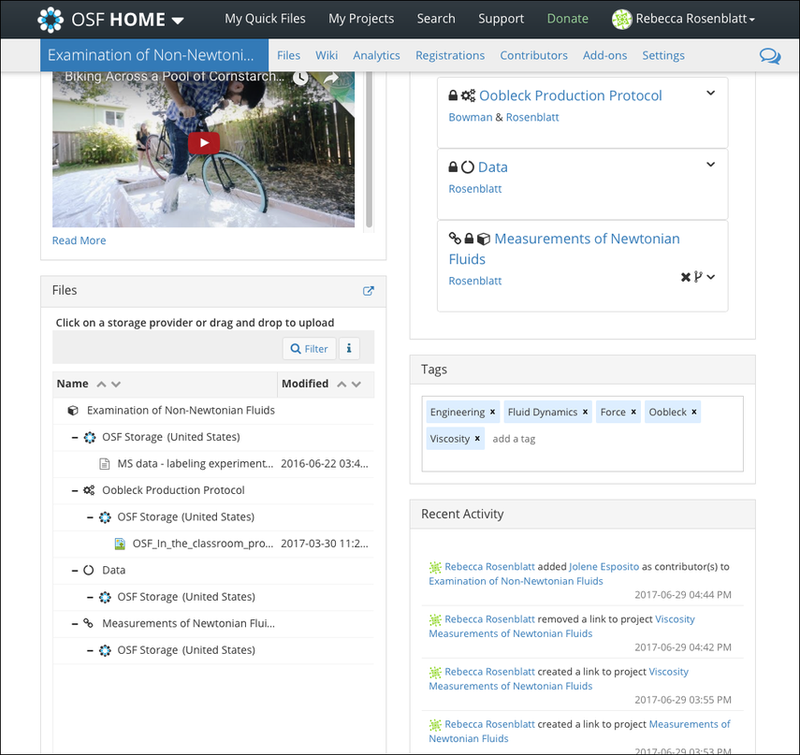 Go to your "Project Overview" or "Component Overview" page. 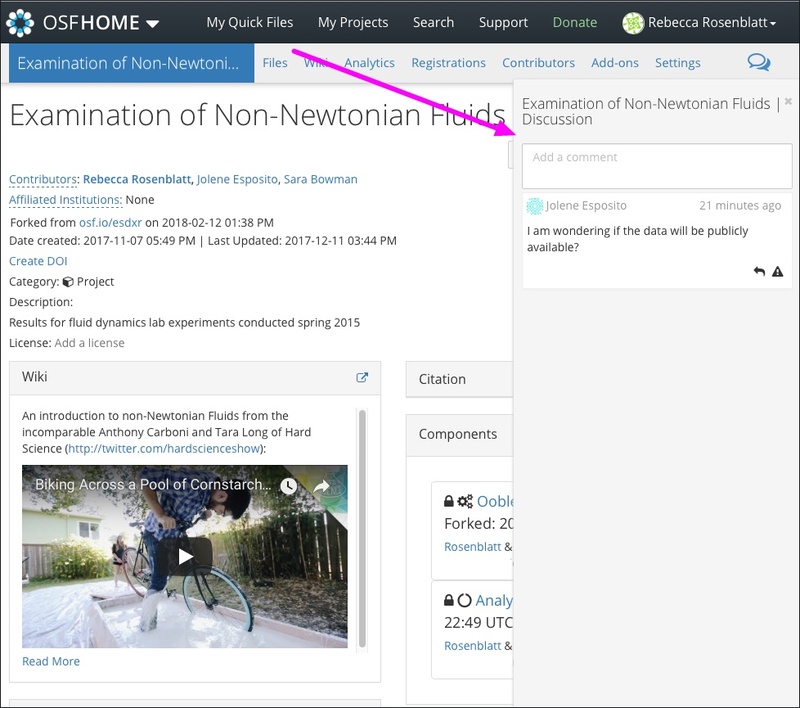 To read or make comments on a project or component, click the blue speech bubbles on the right of the navigation bar. The "Discussion" panel will expand. To make a comment, type into the text box. When you start typing, a character count will appear in the bottom right of the box. There is a 1000-character limit per comment. When you're finished writing your comment, click the Comment button. Your comment will appear in the "Discussion" panel. To reply to a comment, click the arrow symbol on the bottom right of the comment. A textbox will appear below the comment. Type your reply into the text box. When you start typing, the "Comment" button will appear below the textbox. Click the Comment button when you're finished writing your reply. Your reply will appear in the "Discussion" panel. To address a comment to a contributor, type @, and a list of the project's contributors will appear. 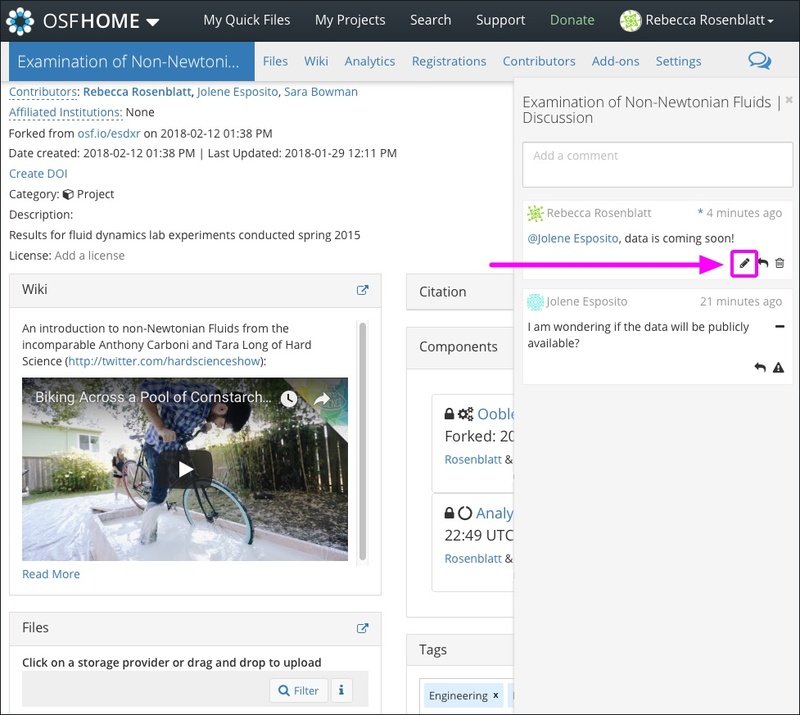 Select the contributor from the list that you want to address, and the contributor's name will appear in the textbox. Next, type in your comment, and then click the Comment button. The mentioned contributor will receive an email notifying them that they have been addressed. You can only edit your own comments. Click the pencil icon in the bottom right of the comment box. Type your new comment, then click the Save button to apply the new changes. An asterisk will appear in the top right of the comment box, indicating that the comment has been edited. When you hover over the asterisk, a tooltip will tell you when the user last modified the comment. You can only delete your own comments. To delete your comment, click the trash icon in the bottom right of your comment. Then, click the red Delete button that appears below the textbox. A confirmation message and a link to restore your comment will appear in place of your comment. You can restore your comment at any time. 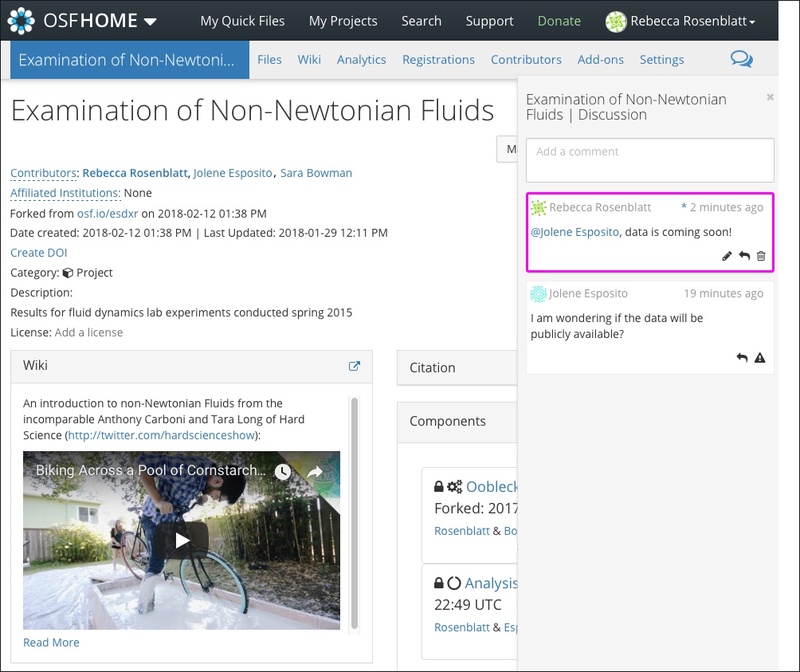 Find the "Files" section on the project or component's "Overview" page. 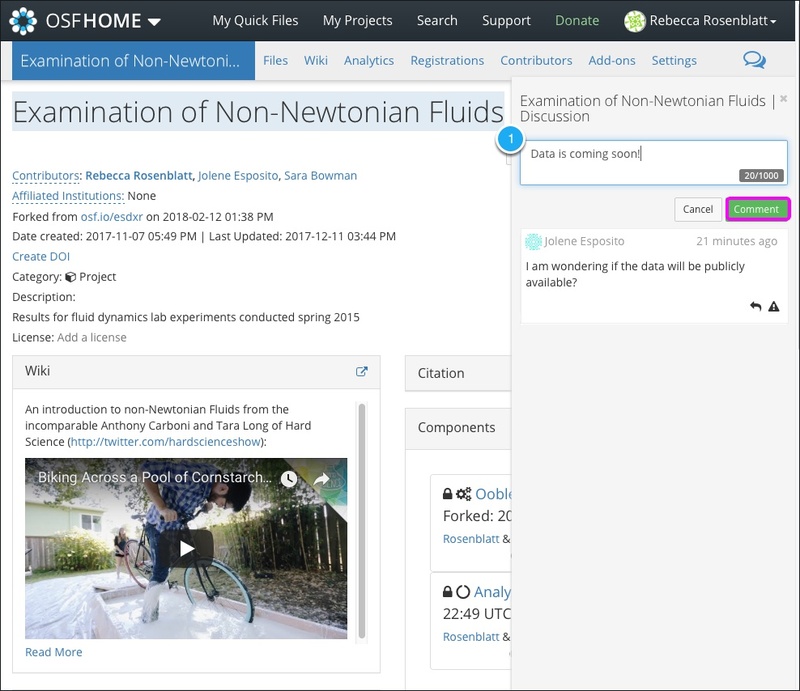 Next, click on a file, and the "File Details" page will appear. 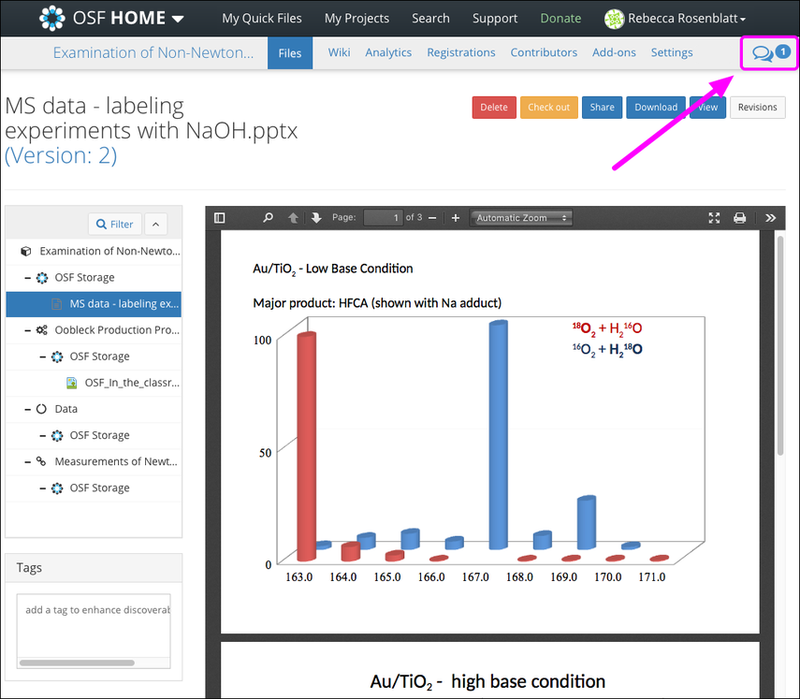 To read or make comments on a file, click the blue speech bubbles on the right of the project's navigation bar. 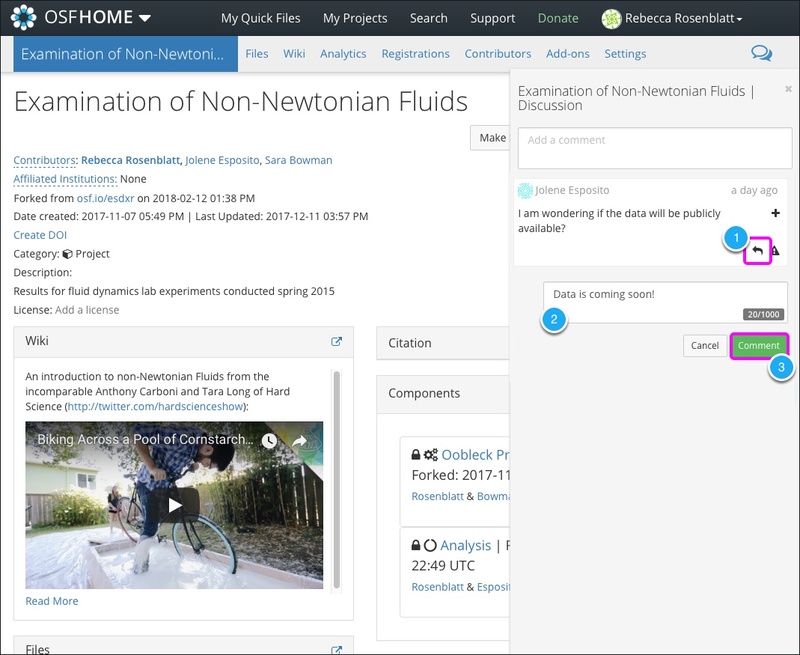 You can write, reply, edit, and delete a comment on a file in the same way as you can on the project or component.